Qt Extended has a powerful theming engine, allowing much of the user interface to be customized and personalized. Components of the user interface such as Title Bar, Home Screen, Call Screen, Context Bar use Themed Views to facilitate customization. These are defined by XML files describing a hierarchical group of visual and formatting elements. Themed Views contain theme elements which define the layout and structure of components. Each of these elements is assigned attributes to customize visual appearance and placement. In addition to simple vector content, themes can conditionally contain rich QWidget content. The Qt Extended home screen has been enabled in this way, and widgets can be added using the HomeScreenWidgets class. 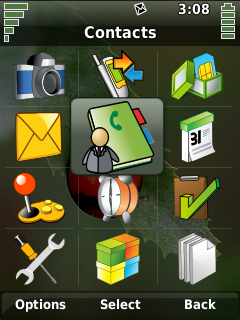 It is also possible to provide color schemes and custom icons with a theme. Theming code examples are available on the: Tutorials page. Usually contains three buttons corresponding to context buttons on the keypad. Displays as either text or icons. 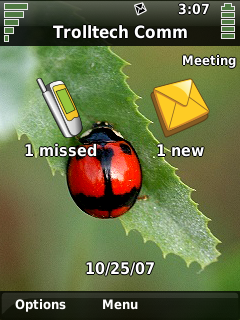 Widget style and icons can help to complete the effect, however since these are far more time consuming to produce it is common to use those provided by an existing theme. Code examples are available at: Theming Tutorials. modify $QPEDIR/src/custom.pri to have an additional THEME_PROJECT entry that states the theme directory. run bin/qbuild image to install the theme. Theme Project File $QPEDIR/etc/themes/ defines the files to be installed for the theme. Theme Configuration File $QPEDIR/etc/themes/ defines the theme.